BigPoint, publisher of Seafight with FreeMMORPGlist.Com, MMOReviews.Com, F2P.Com, GratisMMORPG.De, MMORPG Gratis.Com , JuegaenRed.Com, MMOGratuit.Com, MMOGratis.Com and GiochiMMO.it to offer a free item giveaway for Seafight, the Dead Anchors Package. Step 3. 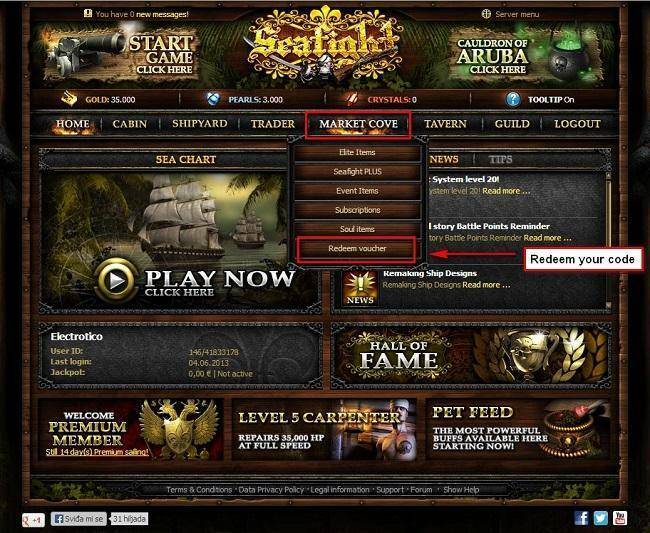 Register at Seafight and log in game.	. Step 4. Go to the "Market Cove"� after to "Redeem voucher" , and redeem your code there. Seafight is a free to play browser-based MMORPG in which players command a ship and sail through the high seas to complete epic quests and earn gold to upgrade their ships and destry enemies. It offers an open pvp rule set.